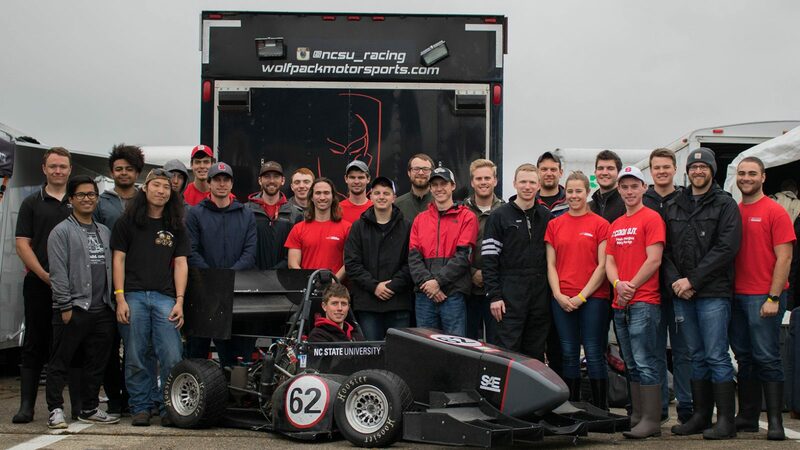 The Wolfpack Motorsports Formula SAE team competed in the International Formula SAE Competition at Michigan International Speedway in Brooklyn, Michigan the weekend of May 9, 2018. Due to poor weather conditions, the team placed 68 out of 114 teams. “The team was struggling to lay down good times in the wet conditions due to a lack of practice time in such conditions,” explains team captain Zachary Zimits. “If anyone knows of a large, open, paved parking lot that is available to test in, that would really help.” Despite placing lower overall than the team hoped, they did walk away with a couple positives. Their vehicle design tied for 17th, and they won third place in the Mahle Ingenuity Award competition for their dry sump oil system. The team will appear next at the Lincoln Nebraska competition at the end of June. The SAE International Formula SAE program is an engineering design competition for undergraduate and graduate students. The competition provides participants with the opportunity to enhance their engineering design and project management skills by applying learned classroom theories in a challenging competition. The engineering design goal for teams is to develop and construct a single-seat racecar for the non-professional weekend autocross racer with the best overall package of design, construction, performance and cost. The concept behind Formula SAE is that a fictional manufacturing company has contracted a design team to develop a small Formula-style racecar. The prototype racecar is to be evaluated for its potential as a production item. The target marketing group for the racecar is the non-professional weekend autocross racer. Each student team designs, builds and tests a prototype based on a series of rules whose purpose is both to ensure onsite event operations and promote clever problem solving. The vehicle is inspected in a series of tests to ensure it complies with the competition rules; in addition, the vehicle with driver is judged in many performance tests on track. The rest of the judging is completed by experts from motorsports, automotive, aerospace and supplier industries on student design, cost and sales presentations.